Note  Checking the box above will not relieve any registrant required to file reports pursuant to Section 13 or Section 15(d) of the Exchange Act from their obligations under those Sections. State the aggregate market value of the voting and non-voting common equity held by non-affiliates computed by reference to the price at which the common equity was last sold, or the average bid and asked price of such common equity, as of the last business day of the registrants most recently completed second fiscal quarter: Not applicable. There were 291,009 shares of limited liability company membership interests outstanding at March 15, 2010. Certain statements within this annual report on Form 10-K may constitute forward-looking statements within the meaning of the Private Securities Litigation Reform Act of 1995 (PSLRA). These statements are being made pursuant to the PSLRA, with the intention of obtaining the benefits of the safe harbor provisions of the PSLRA, and, other than as required by law, we assume no obligation to update or supplement such statements. Forward-looking statements are those that do not relate solely to historical fact. They include, but are not limited to, any statement that may predict, forecast, indicate or imply future results, performance, achievements or events. You can identify these statements by the use of words such as may, will, could, anticipate, believe, estimate, expect, continue, further, plan, seek, intend, predict or project and variations of these words or comparable words or phrases of similar meaning. These forward-looking statements reflect our current beliefs and expectations with respect to future events and are based on assumptions and are subject to risks and uncertainties and other factors outside our control that may cause actual results to differ materially from those projected. We undertake no obligation to update publicly or review any forward-looking statement, whether as a result of new information, future developments or otherwise. Macquarie Equipment Leasing Fund, LLC is not an authorized deposit-taking institution for the purposes of the Banking Act 1959 (Commonwealth of Australia) and its obligations do not represent deposits or other liabilities of Macquarie Bank Limited ABN 46 008 583 542 (MBL). MBL does not guarantee or otherwise provide assurance in respect of the obligations of Macquarie Equipment Leasing Fund, LLC. Except as otherwise specified, we, us, and our refer to Macquarie Equipment Leasing Fund, LLC (the Fund), a Delaware limited liability company. Macquarie Equipment Leasing Fund, LLC, a Delaware limited liability company, was formed on August 21, 2008 for the purpose of acquiring a diversified portfolio of equipment and equipment leases. The Fund will also make investments in other equipment related transactions which will allow it to directly or indirectly participate in the benefits and risks of equipment ownership or usage. The Fund is currently in its offering period, which commenced on June 19, 2009 and is anticipated to end in June 2011. It is currently in the process of raising capital. As of March 5, 2010, the Fund has received and accepted cumulative subscriptions for 290,509 shares of limited liability company interest (Shares) for $2,837,350, which exceeded the minimum offering amount of $2,500,000. As a result, subscription proceeds were released from escrow to commence principal operations and reimburse organization and offering fees and expenses. Subsequent capital contributions will be used to fund operations, invest in equipment, equipment leases and other equipment related transactions and pay fees and expenses as described in the Funds Registration Statement on Form S-1 (No. 333-154278), as amended (the Registration Statement on Form S-1). When the Funds offering period ends, the Fund will enter into its operating period, whereupon it may continue to make investments in equipment, equipment leases and other equipment related transactions. The Fund is offering a total of 15,000,000 Shares for a price of $10.00 per share, subject to certain reductions. The Fund is also offering up to 800,000 Shares pursuant to its distribution reinvestment plan at a public offering price of $9.00 per Share. The Funds manager, Macquarie Asset Management Inc., intends to purchase up to $1,500,000 of the Funds Shares at $9.30 per Share, which represents the offering price less the selling commissions. The Funds fiscal year end is December 31. The Fund will acquire a diversified portfolio of equipment and equipment leases. The Fund will also make investments in other equipment related transactions which will allow it to directly or indirectly participate in the benefits and risks of equipment ownership or usage. Preserve, protect and return invested capital. The Fund intends to build a portfolio of equipment, equipment leases and other equipment related investments with the objective of preserving, protecting and returning invested capital. Generate regular monthly cash distributions. The Fund will develop a portfolio of varied equipment types, transaction types, clients and transaction durations with the objective of receiving regular cash from its investments. The Fund intends to generate cash through rental payments from its clients, from the sale of equipment, from the sale of leases and from other investments. In turn, the Fund intends to make regular monthly cash distributions beginning the month after the initial closing date of its offering and up to the end of its operating period. Reduce the Funds overall risk through diversification of its portfolio. The Fund intends to diversify its portfolio by acquiring, directly or indirectly, different types of assets, by entering into or acquiring leases of different durations and by acquiring equipment and investing in other equipment related transactions in different geographies and industries. Diversification of the Funds portfolio will reduce its risk of changes in any particular market sector or of any particular clients willingness or ability to make payments under a lease. Generate investment returns that are not correlated to returns from listed stock and bond markets. The Fund intends to generate investment returns for its members that will not be correlated to listed stock and bond markets. The Funds Shares will not be traded on any listed exchange and the value of the Shares will not be subject to fluctuations on those exchanges. Generate a favorable total return on investments. The Funds portfolio will be structured with the objective of providing its members with a favorable total return on their investment. Although the final composition of the Funds portfolio cannot be determined at this stage, the Fund expects to invest in rail equipment, such as freight cars or locomotives, maritime equipment, aviation equipment, such as commercial jet engines, road transportation equipment, manufacturing equipment, mining and construction equipment, technological and communications equipment, utilities equipment and/or other types of equipment that the Macquarie Asset Management Inc (the Manager) determines may meet the Funds investment objectives. The Fund expects to invest in equipment located both within and outside the U.S. The majority of the equipment purchased by the Fund will be leased to corporate clients. When contemplating investments in equipment, the Manager may consider a range of factors including the remaining economic useful life of the equipment, the anticipated residual value of the equipment, whether the equipment is new or used and the condition of the equipment, equipment registration and regulatory considerations, portfolio diversification, client considerations such as available financial information about the client and how essential the equipment is to the operations of the client, the cash flow profile of the equipment and the depth of the equipment market and exit mechanisms. The Funds manager is Macquarie Asset Management Inc. The Funds investment decisions are made by the Managers investment committee or by the Managers board of directors. The Manager is a member of the Macquarie Group. The Macquarie Group, whose predecessor, Hill Samuel Australia Limited, was founded as a subsidiary of the UK merchant bank, Hill Samuel & Co., in 1969, is a diversified international provider of banking, financial, leasing, advisory and investment services. Headquartered in Sydney, Australia, the parent entity of the Macquarie Group, Macquarie Group Limited, is listed on the Australian Stock Exchange. As of January 5, 2010, the Macquarie Group operated in more than 70 offices in 28 countries and had approximately 14,400 employees, over 2,400 of whom were located across North and South America. The Macquarie Group operates a diversified range of financial services activities. These activities include banking services, leasing services, retail and institutional funds management services, corporate advisory services, real estate services, securities research and brokerage services and treasury and commodity services. As of January 5, 2010, the Macquarie Group had assets under management of approximately $313 billion. These assets are either held by the Macquarie Group or by various listed and unlisted funds managed by the Macquarie Group. accounting, legal, tax and compliance services for equipment leases. Examples of equipment currently or previously financed by the Macquarie Group under various lease structures include railcars, locomotives and trams, railway infrastructure, commercial jet aircraft engines, aircraft, semiconductor manufacturing equipment, maritime vessels, information technology equipment, utility equipment, telecommunications equipment, medical equipment, road transportation equipment, power stations, electricity grids, marshalling yards, handling equipment, environmental and energy equipment and construction equipment. In managing the Fund, the Manager will have access to the experienced leasing, funds management and other resources of the Macquarie Group. While the directors of the Manager have relevant experience in equipment leasing for the Macquarie Group, the Manager is a newly formed entity which has never managed a private or public equipment leasing fund or program. Annual world leasing volume is in excess of $640 billion. North America comprises approximately 20.9% of annual world leasing volume, Europe 48.5% and Asia 19.3%. The top 15 countries, measured by way of annual leasing volume (in parentheses), are as follows: U.S. ($110 billion), Germany ($72 billion), Japan ($67 billion), Brazil ($45 billion), France ($40 billion), Italy ($40 billion), Russia ($25 billion), China ($22 billion), United Kingdom ($19 billion), Canada ($18 billion), Spain ($17 billion), Poland ($13 billion), Switzerland ($11 billion), Sweden ($10 billion) and the Netherlands ($9 billion). Since 1988, the global aggregate annual leasing volume has grown from $194 billion to over $640 billion. Captive lessors, meaning they only provide lease financing for one brand of equipment. Independents, meaning they are not affiliates of banks and are not captives. Equipment Segments. Certain leasing companies may provide lease financing for specific items of equipment, whereas other lease companies may focus on a broad range of equipment. Lease Types. Leasing companies may provide full-payout leases only, whereby they are not accepting direct residual value risk in the underlying equipment. Other leasing companies may accept residual value risk in equipment, most typically by offering non-full payout leases. Big Ticket versus Small Ticket. Big ticket leasing companies tend to provide lease financing for high value items of equipment, such as maritime vessels, aircraft or railcars. Small ticket leasing companies focus on providing lease financing for small value items of equipment. Customer Type. Leasing companies may provide services to a broad client base, although certain leasing companies may focus specifically on the provision of services either to individuals, small businesses, corporations or public clients. Geographical Footprint. Leasing companies range from those with a global mandate to purely national or regional leasing companies. The Fund anticipates that it will be a global, big ticket leasing company with a focus on providing non-full payout (operating) leases to mainly corporate clients across numerous equipment classes. Its returns will be influenced by competitive conditions existing within the equipment leasing industry, including general economic conditions and its ability to provide lease pricing which is attractive versus competitors. The Fund has no direct employees. The Manager has full and exclusive control over the Funds management and operations. There are certain material conditions and restrictions on the transfer of Shares imposed by the terms of the Funds operating agreement between the Fund and the Manager. Consequently, there is no public market for Shares and it is not anticipated that a public market for Shares will develop. As of December 31, 2009, as the Funds minimum offering amount of $2,500,000 had not yet been raised, the Fund had not accepted any members other than the Manager as member of the Fund. As of March 5, 2010, the Fund had received and accepted cumulative subscription of $2,837,350 from 60 members in addition to initial capital contribution of $5,000 from the Manager. The following is a discussion of the Funds current financial position and results of operations. This discussion should be read together with the Funds financial statements contained under Item 8 of this annual report on Form 10-K. The Fund is a Delaware limited liability company formed on August 21, 2008. The Fund will pool the capital invested by its members with borrowings to acquire a diversified portfolio of equipment and equipment leases. The Fund may also make investments in other equipment related transactions which will allow it to directly or indirectly participate in the benefits and risks of equipment ownership or usage, such as trading transactions, residual value guarantees, forward purchase agreements, total lease return swaps, participation agreements, equipment purchase options and joint ventures. The pooled capital contributions will also be used to pay fees and expenses associated with the Funds offering and its operations and to fund a reserve. The majority of equipment that the Fund will purchase will be accompanied by a lease of that equipment to third parties, though the Fund may also invest in other types of equipment related transactions. The Fund anticipates that its operations will continue for approximately eight years. The Funds operations are divided into three phases. The first phase, called the offering period, will last for up to two years. During this period, members capital will be raised and investments shall be made by the Fund once a minimum of $2,500,000 of member capital has been accepted by the Fund. The offering period commenced on June 19, 2009. As of March 5, 2010, the Fund had received and accepted cumulative subscriptions for 290,509 Shares for $2,837,350, in additional to initial capital contribution of $5,000 from the Manager. As a result, subscription proceeds were scheduled to be released from escrow to commence principal operations and reimburse organization and offering fees and expense. The second phase, called the operating period, is anticipated to last five years from the end of the offering period, but may last longer. During this period, the Fund will invest and re-invest in equipment, equipment leases and other equipment related transactions. The third phase, called the liquidation period, is anticipated to last one year from the end of the operating period, but not more than three years from the end of the operating period. During this period, the Fund will dispose of the remainder of its portfolio and make final distributions to its members. The Fund is managed by its Manager, Macquarie Asset Management Inc., a member of the Macquarie Group Limited group of companies. As of December 31, 2009, the Fund had not raised its minimum offering amount of $2,500,000; had not accepted any members, other than the Manager; and had not made any investments or purchases of equipment, equipment leases or other equipment-related investments. As of March 5, 2010, the Fund had received and accepted cumulative subscription of $2,837,350 from 60 members in addition to initial capital contribution of $5,000 from the Manager. Expenses incurred since inception totaled $526. Total expenses for the year ended December 31, 2009 amounted to $410, primarily related to administrative charges for the cash balance held at a financial institution. The Funds offering period commenced on June 19, 2009. As of the filing date the Fund had not commenced any investment operations. As of March 5, 2010, the Fund had received and accepted cumulative subscriptions for 290,509 shares for $2,837,350, in additional to initial capital contribution of $5,000 from the Manager. As a result, subscription proceeds were scheduled to be released from escrow to commence principal operations and reimburse the Manager for organization and offering fees and expenses. Subsequent capital contributions will be used to fund operations, invest in equipment, equipment leases and other equipment related transactions and pay fees and expenses as described in the Registration Statement on Form S-1. At December 31, 2009 and December 31, 2008, the Fund had cash and cash equivalents of $4,474 and $4,884, respectively, from the initial capital contribution of the Manager. The Funds cash is held at a financial institution. As of December 31, 2009 the Fund had not received or accepted the minimum offering amount of $2,500,000 and had not commenced any operations. As of March 5, 2010 the Fund had reached its minimum offering amount of $2,500,000 and the subscription proceeds were released to the Fund from escrow. The amount will be applied towards the payment or reimbursement of the Funds organization and offering expenses, selling commissions, dealer manager fees and due diligence expenses. The remaining amount will be available for investment, operations, the creation of reserves and the payment of acquisition fees. The Fund intends to establish working capital reserves of approximately 1.0% of the gross offering proceeds. Until offering proceeds are used for the acquisition or operation of the Funds portfolio, the offering proceeds will be held in an interest bearing escrow account at Wells Fargo Bank, National Association. The Fund will continue to sell its Shares until the end of the offering period. As additional Shares are sold, the Fund will experience an increase in liquidity as cash is received. As the Fund uses cash to acquire equipment or other equipment-related investments, its liquidity will decrease. The Funds maximum offering amount is $150,000,000, plus up to an additional $7,200,000 under the Funds distribution reinvestment plan. The Funds liquidity may be adversely affected by unanticipated or greater than anticipated operating costs or losses, including the inability of a client of the Fund to make timely lease payments. The Fund anticipates that it will fund its operations from cash flow generated by operating and financing activities. The Manager has no intent to permanently fund any cash flow deficit of the Fund or provide other financial assistance to the Fund. The Fund intends to incur indebtedness in purchasing its portfolio. During periods of general illiquidity in financial markets, such as existed during 2008 and 2009, it may not be possible for the Manager to source debt on the Funds behalf at an appropriate interest rate, on appropriate terms, at appropriate levels or at all. The Fund has no contractual obligations and commitments at December 31, 2009. The preparation of financial statements in conformity with accounting principles generally accepted in the United States of America requires management to make estimates and assumptions that affect the reported amounts of assets and liabilities and disclosure of contingent assets and liabilities at the date of the balance sheets. Actual results could differ from those estimates. The Fund considers all highly liquid investments with an original maturity of three months or less at the time of purchase to be cash equivalents. Cash and cash equivalents are maintained with one financial institution. The Fund is a single member Limited Liability Company and uses the liability method for accounting for income taxes in accordance with Accounting Standards Codification 740, Income Taxes. Under this method, deferred income tax assets and liabilities are determined based on differences between the financial reporting basis and tax basis of assets and liabilities and are measured using enacted tax rates and laws that will be in effect when the differences are expected to reverse. Valuation reserves are established when it is determined that it is more than likely than not that the deferred income tax asset will not be realized. The Fund records its benefit for income taxes as amounts due based upon the estimated taxes that would be due if the Fund had filed its income tax returns on a separate entity basis and will be settled via an informal tax sharing agreement with the Manager. The Funds share of current and deferred federal and state tax benefits or obligations are recorded as taxes receivable (related party) in the balance sheet. When the Fund receives and accepts subscriptions for a minimum offering amount, as noted above, this guidance should no longer apply. The Fund expects to be treated as a partnership for federal and, if applicable, state income tax purposes. As a partnership, the Fund itself is not subject to federal and state income taxes, while each member will be individually liable for income taxes, if any, of its share of net taxable income from the Fund. Interest, dividends and other income realized by the Fund may be subject to withholding tax in the jurisdiction in which the income is sourced. The Fund complies with the reporting requirements of Accounting Standards Codification 915, Development Stage Entities. In June 2009, the FASB issued Accounting Standards Update 2009-01. This guidance sets forth the Accounting Standards Codification that will be the single source of authoritative U.S. GAAP for all nongovernmental entities. The Codification supersedes all existing non-SEC accounting and reporting standards. This guidance is effective for financial statements issued for interim and annual periods ending after September 15, 2009. Since this guidance only requires amended disclosures concerning the reporting of accounting standards, the adoption of this guidance did not have a material impact on the Funds financial statements. financial statements, this guidance also requires disclosure of the nature and effect of such in the financial statements. In February 2010, FASB issued Accounting Standards Update (ASU) 2010-09 Amendments to Certain Recognition and Disclosure Requirements. The guidance requires an entity that is either an SEC filer or a conduit bond obligor for conduit debt securities that are traded in a public market to evaluate subsequent events through the dates financial statements are issued. All other entities are required to evaluate subsequent events through the date financial statements are available to be issued. It also requires all entities excluding the SEC filers to disclose the dates through which the subsequent events have been evaluated. The adoption of these pronouncements did not have a material impact on the Funds financial statements. The preparation of our financial statements requires management of the Manager, as it is applicable to the Fund, to make estimates and judgments that affect the amounts reported in the financial statements and accompanying notes. Management of the Manager bases its estimates on historical experience of its affiliates and on various other assumptions that it believes to be reasonable under the circumstances. Actual results could differ from these estimates under different assumptions and judgments and uncertainties, and potentially could result in materially different results under different conditions. Since the commencement of the Funds offering period to the end of the period covered by this annual report on Form 10-K, the Fund had not raised its minimum offering amount of $2,500,000 and so had not made any investments or acquisitions of equipment, equipment leases or other equipment-related investments. As such, the Fund had no investments subject to market risk. As of March 5, 2010, the Fund received the minimum offering amount of $2,500,000. The Fund will commence making investments in equipment, equipment leases and other equipment related transactions. At that time, the Fund will be exposed to certain market risks. Among these are the risks that equipment the Fund purchases will be worth less than anticipated at the end of the term of the lease; the risk that the Funds clients will fail to pay rent as required under its leases; and the risk that the Fund may not be able to source appropriate or attractive investments given the highly competitive nature of the equipment leasing industry. In our opinion, the accompanying balance sheets present fairly, in all material respects, the financial position of Macquarie Equipment Leasing Fund, LLC (a development stage enterprise) (the Company) at December 31, 2009 and 2008 in conformity with accounting principles generally accepted in the United States of America. These financial statements are the responsibility of the Companys management; our responsibility is to express an opinion on the financial statements based on our audits. We conducted our audits of these statements in accordance with the standards of the Public Company Accounting Oversight Board (United States). Those standards require that we plan and perform the audit to obtain reasonable assurance about whether the balance sheets are free of material misstatement. An audit includes examining, on a test basis, evidence supporting the amounts and disclosures in the balance sheet, assessing the accounting principles used and significant estimates made by management, and evaluating the overall financial statement presentation. We believe that our audits of the balance sheets provide a reasonable basis for our opinion. See accompanying notes to the Balance Sheets. Macquarie Equipment Leasing Fund, LLC ( the Fund), a Delaware limited liability company, was formed on August 21, 2008 for the purpose of being an equipment leasing program that will acquire a diversified portfolio of equipment, equipment leases and other equipment related-investments. The majority of the equipment will be leased to corporate clients. The Fund will generate income through the collection of lease rentals and other revenues, through the sale of leased equipment and other portfolio investments. The Funds fiscal year end is December 31. The manager of the Fund is Macquarie Asset Management Inc. (the Manager), a member of the Macquarie Group of companies which is comprised of Macquarie Group Limited and its subsidiaries and affiliates worldwide (the Macquarie Group). Macquarie Group Limited is headquartered in Australia and is listed on the Australian Stock Exchange. The Manager will earn fees by providing or arranging all services necessary and desirable for the operations of the Fund, including those relating to equipment acquisitions and disposals, asset management and administrative, reporting and regulatory services. Further, the Fund will reimburse the Manager for costs incurred by them in managing the Fund and the Funds portfolio of equipment, equipment lease and other equipment related investments. The Fund received an effectiveness order for its Amendment No. 4 to Registration Statement on Form S-1 (the Registration Statement on Form S-1) from the Securities and Exchange Commission on June 19, 2009. The Fund is considered to be a development stage enterprise as no operations have commenced since its effectiveness order. The Funds sole activity through December 31, 2009 consisted of the organization and start-up of the Fund. The initial capitalization of the Fund was $5,000 from the Manager. The Fund is offering membership interests on a best efforts basis with the intention of raising up to $157,200,000 of equity. As of December 31, 2009, no fees were payable by the Fund to the Manager as the Fund had not received or accepted subscriptions for the minimum offering amount of $2,500,000, excluding the initial $5,000 capital contribution from the Manager. The Fund expects the share offering period to last for up to 24 months from the date of the offering. differences are expected to reverse. Valuation reserves are established when it is determined that it is more than likely than not that the deferred income tax asset will not be realized. In June 2009, the Financial Accounting Standards Board (FASB) issued Accounting Standards Update 2009-01. This guidance sets forth the Accounting Standards Codification that will be the single source of authoritative U.S. GAAP for all nongovernmental entities. The Codification supersedes all existing non-SEC accounting and reporting standards. This guidance is effective for financial statements issued for interim and annual periods ending after September 15, 2009. Since this guidance only requires amended disclosures concerning the reporting of accounting standards, the adoption of this guidance did not have a material impact on the Funds financial statements. In May 2009, the FASB issued Accounting Standards Codification (ASC) 855 Subsequent Events, which sets forth the accounting and disclosure requirements for subsequent events; events that occur after the balance sheet date, but before financial statements are issued or are available to be issued. This guidance requires disclosure of the date through which subsequent events have been evaluated. If the subsequent events are not recognized in the financial statements, this guidance also requires disclosure of the nature and effect of such in the financial statements. In February 2010, FASB issued ASU 2010-09 Amendments to Certain Recognition and Disclosure Requirements. The guidance requires an entity that is either an SEC filer or a conduit bond obligor for conduit debt securities that are traded in a public market to evaluate subsequent events through the dates financial statements are issued. All other entities are required to evaluate subsequent events through the date financial statements are available to be issued. It also requires all entities excluding the SEC filers to disclose the dates through which the subsequent events have been evaluated. The adoption of these pronouncements did not have a material impact on the Funds financial statements. As discussed in Note 1, Organization and Business Operations, the Fund will pay fees to the Manager for providing or arranging all services necessary for its operations, including those relating to equipment acquisitions and disposals, asset management and administrative, reporting and regulatory services once the minimum offering amount of $2,500,000 has been received and accepted. As of December 31, 2009 the Fund had not paid any fees to the Manager. Macquarie Capital (USA) Inc. (the dealer manager) will act as dealer manager for the Fund and will manage a group of selling dealers, including other unaffiliated broker dealers. up to 1.60% of the offering proceeds from each share sold for shares sold that exceed 7,500,000 shares. Reimbursement of operating expenses depending upon the scope of services the Manager provides to the Fund. The Manager has made an initial equity contribution of $5,000 to the Fund for 500 shares of membership interests at a price of $10 per share. The Funds offering period commenced on June 19, 2009. The Fund could not commence investment operations until the minimum of $2,500,000 in member capital had been accepted by the Fund. As at the end of December 31, 2009, the Fund had accepted no member capital and made no investments. As such, no revenue from operations was received by the Fund during the year ended December 31, 2009. Expense incurred since inception totaled $526. Total expenses for the year ended December 31, 2009 amounted to $410, primarily related to administrative charges for the cash balance held at a financial institution. As of March 5, 2010, the Fund had received and accepted cumulative subscription for 290,509 for $2,837,350, which exceeded the minimum offering amount of $2,500,000, in addition to initial capital contribution of $5,000 from the Manager. As a result, subscription proceeds were released from escrow to commence principal operations and reimburse organization and offering fees and expenses. Subsequent capital contribution will be used to fund operations, invest in equipment, equipment leases and other equipment related transactions and pay fees and expenses as described in the Registration Statement on Form S-1. Under the direction and with the participation of the Managers President and Principal Financial Officer, the Fund evaluated its disclosure controls and procedures (as such term is defined under Rule 13a-15(e) or 15d-15(e) of the Exchange Act) as of the end of the period covered by this report. Based on that evaluation, our Managers President and Principal Financial Officer concluded that the Funds disclosure controls and procedures were effective as of December 31, 2009. There has been no change in the Funds internal controls over financial reporting (as defined in Rule 13a-15(f) or Rule 15d-15(f) of the Exchange Act) that occurred during the quarter ended December 31, 2009 that has materially affected, or is reasonably likely to materially affect, the Funds internal controls over financial reporting. This annual report on Form 10-K does not include a report of managements assessment of internal control over financial reporting or an attestation report of the Funds registered public accounting firm due to a transition period established by rules of the Securities and Exchange Commission for newly public companies. the Managers telephone number, 866-965-7622. The Manager is a member of the Macquarie Group. In managing the Fund, the Manager will have access to the experienced leasing, funds management and other resources of the Macquarie Group. While the directors of the Manager have relevant experience in equipment leasing for the Macquarie Group, the Manager is a newly formed entity which has never managed a private or public equipment leasing fund or program. 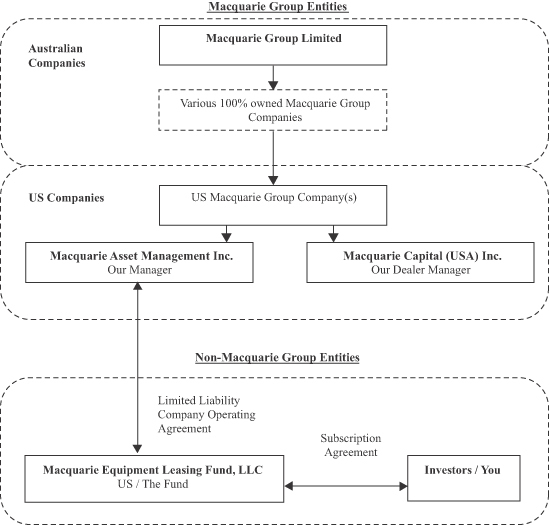 The following organization chart sets out the ownership relationship between the Manager, the Funds dealer manager, Macquarie Capital (USA) Inc. and the Macquarie Group as of the date of this annual report on Form 10-K. It does not contain all of the subsidiaries of Macquarie Group Limited. All arrows represent a 100% shareholding in the subsidiary companies. The following table provides information regarding the members of the board of directors and the executive officers of the Manager. structured technology syndication investments business. Prior to joining Macquarie, Mr. Fahy was employed at Coopers and Lybrand in Sydney, Australia from January 1987 to September 1998 in a number of roles, including that of Tax Director, and at Ernst & Young in Dublin, Ireland from September 1982 to December 1986 in a number of roles, including that of chartered accountant. Mr. Fahy holds a Bachelor of Commerce from University College Galway, Ireland and is a Fellow of the Institute of Chartered Accountants in Ireland and a member of the Institute of Chartered Accountants in Australia. Duncan Edghill, Director and Vice President of our manager, joined the Macquarie Group in February 2001. Situated in Boston, Mr. Edghill has been primarily dedicated to the operations of the Manager since its inception. From April 2005 to May 2008, Mr. Edghill was based in the Macquarie Groups Vienna, Austria office where he was involved in the establishment of a European equipment leasing business and in the development of equipment leasing investment opportunities for both retail and institutional investors. From February 2001 to April 2005, Mr. Edghill was based in the Macquarie Groups Sydney, Australia office in a variety of equipment leasing roles including that of attorney for several leasing businesses. Mr. Edghill holds a Bachelor of Laws and a Bachelor of Commerce from the University of New South Wales, Sydney, Australia, and is an admitted attorney in New South Wales, Australia. James A. Pitts, Independent Director of the Manager, joined the board of directors of our manager in March, 2009. Situated in Boston, Mr. Pitts has been a Director of Wainwright Bank & Trust Company, a NASDAQ listed community bank, since May 2005. Mr. Pitts has been Chair of Wainwright Bank & Trust Companys Audit Committee since January 2008 and has been a rotating member of its Executive Committee since April 2006. Mr. Pitts has been a Director of the National Association of Corporate Directors New England Chapter and the chair of its Audit Committee since June 2005. From 1996 to May 2004, Mr. Pitts served as the Chief Financial Officer and Treasurer of The Boston Foundation, a $650 million community foundation, and from June 2004 to August 2004, Mr. Pitts served as the Chief Investment Officer and Treasurer of The Boston Foundation. From 1988 to 1996, Mr. Pitts held positions including Executive Vice President and Chief Financial Officer of Clean Harbors, Inc., a NASDAQ listed environmental disposal and service firm, as well as Chief Financial Officer of Bain and Company, an international consulting firm. Prior to that time, Mr. Pitts also held senior financial roles in publicly traded multinational corporations where he held wide responsibilities for SEC reporting, financial statement preparation, internal audit, risk management and compliance and regulatory matters. In his roles as Chief Financial Officer, Mr. Pitts has reviewed and overseen various equipment leasing transactions. Mr. Pitts holds a MBA from the University of Connecticut and a BBA from Niagara University, New York. Mr. Pitts is a Certified Public Accountant and holds a Certificate of Director Education. Under the Funds operating agreement, the board of directors of the Manager must consist of at least one independent director, except for a period of 90 days after the death, removal or resignation of an independent director. An independent director may not, directly or indirectly (including through a member of his or her immediate family), be associated with the Manager or its affiliates within the last two years before becoming a director and at such time an independent director may not own any interest in, be employed by, have any material business or professional relationship with, serve as an officer or director of the Managers affiliates or perform services (other than as an independent director) for the Fund. During the fiscal year ended December 31, 2009, the Fund did not have a class of equity securities registered pursuant to Section 12 of the Securities Exchange Act of 1934, and, therefore, directors, officers and beneficial owners of the Funds equity securities were not subject to the reporting requirements of Section 16(a) of the Securities Exchange Act of 1934. (1) honest and ethical conduct, including the ethical handling of actual or apparent conflicts of interest between personal and professional relationships; (2) full, fair, accurate, timely, and understandable disclosure in reports and documents that the Fund files with, or submits to, the SEC and in other public communications made by the Fund; (3) compliance with applicable governmental laws, rules and regulations; (4) the prompt internal reporting of violations of the code to an appropriate person or persons identified in the code; and (5) accountability for adherence to the code. The code of ethics is available without charge upon request from our Manager, 225 Franklin St, 17th Floor, Suite 1700, Boston, Massachusetts, 02110. The Fund is a manager-managed limited liability company and has no directors or executive officers. As at December 31, 2009, the Funds minimum offering amount of $2,500,000 had not yet been raised. As a consequence, as at that date the Fund had not accepted any members other than the Manager as member of the Fund and no Fund investments had been made. Consequently, the Fund paid no compensation or reimbursement to the Manager or its affiliates for the fiscal year ended December 31, 2009. Once the Funds minimum offering amount is achieved, the Manager, affiliates of the Manager, including Macquarie Capital (USA) Inc. in its capacity as the dealer manager, and certain third party selling dealers will receive fees and compensation from the offering of the Funds Shares. These fees and compensation are described in Note 3 to the Funds financial statements contained under Item 8 of this annual report on Form 10-K.
As of December 31, 2009, as the Funds minimum offering amount of $2,500,000 had not yet been raised, the Fund had not accepted any Members other than the Manager as member of the Fund. Consequently the Manager, Macquarie Asset Management Inc., held beneficially 100% of the issued and outstanding Shares in the Fund, being 500 Shares at $10.00 per Share ($5,000). Form 10-K for a discussion of the Funds transactions with the Manager and its affiliates. Audit fees consist of the aggregate fees and expenses billed in connection with the audit of the Funds annual financial statements and the review of the financial statements included in the Funds quarterly reports on Form 10-Q. Audit fees also represent costs incurred pursuant to the Funds registration statement on Form S-1. As of March 5, 2010 the Fund had reached its minimum offering amount and will reimburse the Funds Manager for organization and offering expenses, including the audit fees. The financial statements Item 8 of this annual report on Form 10-K and schedule listed in the accompanying exhibit index are filed as part of this report. 10.1 Escrow Agreement dated February 2, 2009, between Wells Fargo Bank, National Association (Wells Fargo), the Manager, Macquarie Capital and the Fund, as amended by Amendment to Escrow Agreement dated March 30, 2009 between Wells Fargo, the Manager, Macquarie Capital and the Fund, (1) as amended by Amendment No. 2 to Escrow Agreement dated June 19, 2009 between Wells Fargo, the Manager, Macquarie Capital and the Fund(1). (1) Incorporated by reference to the Funds Registration Statement on Form S-1 (No. 333-154278), as amended. Pursuant to the requirements of the Section 13 or 15(d) of the Securities Exchange Act of 1934, the registrant has duly caused this report to be signed on its behalf by the undersigned, thereunto duly authorized. President of the Manager and Principal Executive Officer of Registrant.